63-72 C-10 Rear StrongArms system . For use w/ Shockwave/Coilover. Includes trailing arms, c-notches, panhard bar, panhard bar brackets, shock cross member, & hardware. The Ridetech C10 StrongArm system replaces OEM leafsprings entirely. We have designed several specific systems for late model full-size and mini trucks. The rear C10 StrongArm system will lower your truck as much as 10” while improving handling and load capacity. Installation is completely bolt-on affair with no welding or fabrication necessary. For the customer that wants a bolt-on system with no fabrication or welding, Ridetech has the answer! Bolt-on installation. No welding required! Designed for use with Shockwaves or CoilOvers. 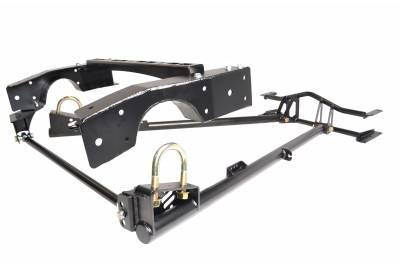 The front trailing arm crossmember is designed to allow the exhaust to be run through it rather than under it providing additional ground clearance. The panhard bar mount has been relocated to optimize the bar length and angle for the lowered height. This helps keep the rearend centered in the truck. The C-notches are included with the kit and FIT the frame rail. With the Ridetech StrongArm system, the driveline angles have been optimized for the lowered height. The StrongArm system includes new trailing arms for the guys with trailing arms that have rusted out. The panhard is adjustable so you can optimize your tire clearance at the new lowered height.